Our services include fertilization, pre-emergent application, olive tree spraying, annual color installation, overseed, palm tree trimming, and weekly maintenance. On your weekly visit, Epic will focus on shrub trimming, weeding, raking, mowing, tending flowers, and irrigation adjustments. At Epic, we have qualified irrigation technicians and a highly trained tree trimming crew. They are available and equipped to respond to emergencies such as storm damage repair, monsoon clean up and major irrigation repairs. Epic also offers power washing, and parking lot sweeping in house to give our clients the tools to stand out from their competitor. 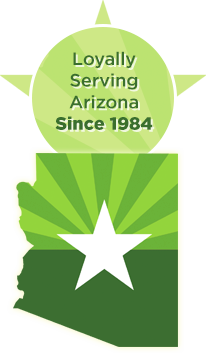 Epic Landscape carries all necessary licensing required by the state of Arizona for pre and post emergent herbicide applications. Epic also holds a special license for turf and ornamental application. Our applicators have undergone extensive training by the state and complete continuing education requirements annually. All Epic Landscape employees are covered by general liability and workmen’s compensation insurance.